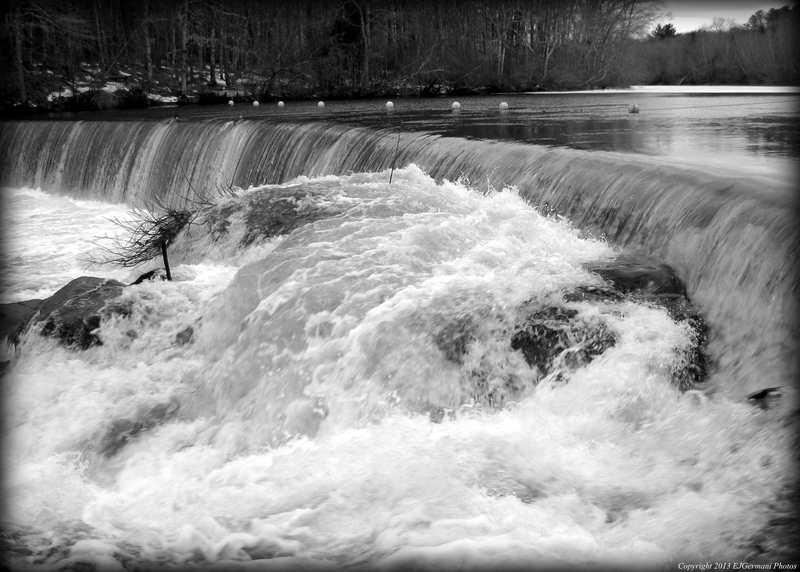 Part of the Blackstone River Valley National Historic Park, Centennial Park offers a tour of yesteryear. The small park is behind the North Smithfield Library on Main Street in the heart of historic Slatersville. This village is the first planned mill village in the United States. The short single out and back trail first leads you down to the shore of the Slatersville Reservoir where you can view two of the three dams at the park. The dams here were built in the mid nineteenth century. Continuing along the trail the Branch River is below to your right and a manmade canal is to the left. This canal is where most of the western mill complex was. The large stone structure across the canal is one of two buildings remaining of the original mill complex. This structure is the picker house. The other remaining structure is the building now used by the library. The trail ends at the next dam just before a stone bridge. This is where the canal dumps back into the Branch River. From here retrace your steps back to the parking area. Also, if you care to wander around, check out the village. There is a ton of history here. Fairly easy will some elevation. Although short in distance, this trail offers quite a bit. The trail head is opposite number 382 Rocky Hill Road and is marked with a sign. The yellow blazed trail passes stone walls and crosses small streams. After climbing over the steepest hill on the property the trail then crosses another stream and splits. The remainder of the trail is a loop that leads back to this point. After doing the loop retrace your steps back to the road. I saw several types of birds here and a few chipmunks. At the time of this hike the leaves were all but off of the trees and covering the rocky trail. Watch your footing. 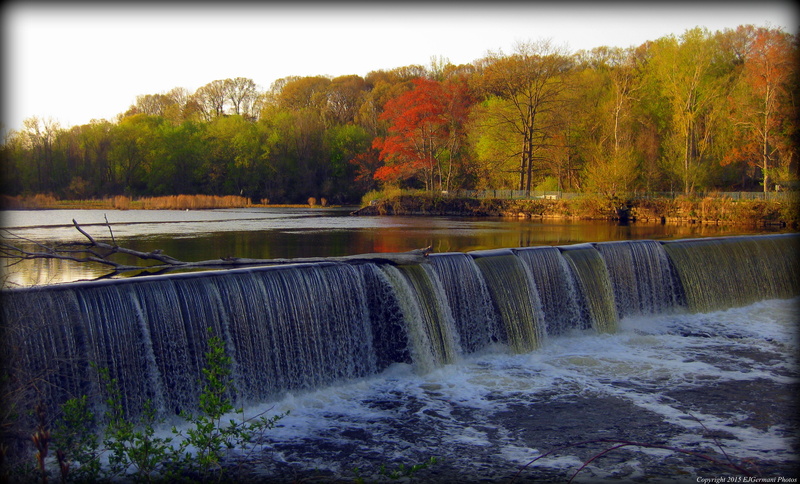 I’ve decided to walk the Blackstone River Bikeway and take in the sights along the way. I’ve broken it up into three sections, all around 3 miles in length. The route I describe will be a one way route, therefore, if you are not doing a car spot you must double the distance listed. I also decided to start in Woonsocket and work my way south for this walk. Starting from the parking area on Davison Avenue, the bike path first follows an access road to the athletic complex. Soon we were passing a soccer field and then following the bike path that lies between the Blackstone River and the Providence & Worcester railroad tracks. Along the bike path there are mile markers. The distances listed are the miles to Providence. Interesting enough there are mile markers along the railroad as well. The “P” stands for Providence and the “W” stands for Worcester. We came across some ducks and swans in some of the inlets of the river. The trees were in spring bloom and the colors were reminiscence of autumn. Next we came to a granite marker with the names of the three towns that converge here. Soon we were passing under the highway bridge that carries Route 99 over the Blackstone. From under the bridge you can get a sense of how deep the valley is here by how high the bridge is. We then came to an area along the river that had a channel next to it. This is one of the sections of what is left of the Blackstone Canal. The canal was built in the 1820’s to connect Providence and Worcester. It would remain in operation until the late 1840’s. By then the railroad had become the primary means of transportation. Most of the canal today has been filled in or is covered in thick brush. The final highlight of this portion of the walk is the Manville Dam. It was built in 1868 and a few years later a mill was built at this site. The mill at the time was the largest textile mill in the United States. We then continued passing under Manville Hill Road and making our way to the parking lot off of New River Road. A couple weeks later we would continue our walk onto the next section of the bike path. Trail map can be found at: Blackstone River North. The temperature on Easter morning at 7:30 am was in the low 30’s. By the end of the hike at 10:00 am it was close to 55°. Spring is definitely here. And sound of wildlife is in abundance. Starting at a small parking area I followed the blue trail through some woods. The blue trail loop splits not too far in. I decided to follow the path to the right. I saw several birds along this stretch. A short distance up, a spur trail leads off to the right to go down to the pond. I was, again, apparently not quiet enough as I scared off some ducks before I reached the shore. Nonetheless, a great photo spot. Back to the blue trail, bypassing the white trail, to a fork. This is where the yellow trail begins. Beware though of the yellow trail. It is the connector trail between the blue loop and the red loop and it is currently not marked very well. I found myself doing a lot of back-tracking. The yellow trail went under a set of power lines, then back into a heavily wooded area. It then proceeded to go by a bench by the second pond, before heading around the edge of the pond. This is where it got a little tricky. The beavers have been hard at work here and part of the yellow trail was covered in water. There were many trees fell by them. I just went around the beaver dam after spotting a blaze on the other side of the water. I then came across a beaver lodge but I did not come across any these beavers. I then proceeded to the end of the yellow trail onto the red loop trail which briefly borders the third pond. After the loop. I retraced my steps (again, with some back-tracking along the yellow trail) back to the parking area. Easy with some slight elevation and optional climbing. The gorge is mostly in Rhode Island although access is only from Massachusetts, and yes, it is in fact a gorge. There is a dam here just before the gorge that made for a couple good pictures. A couple of swans seem to have claimed the area as theirs. The hike is relatively short, just over a mile at most, but the terrain can be a little tricky if you decide to climb any of the rocks. There is one spot that overlooks the gorge that is about 70 feet above the river. A beautiful spot to relax and take in the beauty of the surroundings. Do not get too close to the edge here. Overall, a nice little hike.